Ahh autumn, crisp leaves in red, brown and gold on their way, cardies at the ready, and a few small signs that summer is slowly fading. It also suddenly seems a lot more acceptable to enjoy a slice of cake of an afternoon (or morning in this case). My slow cooker marmalade cake is a rich madeira cake with marmalade added to the mixture and used as a thick glaze on top, and I can attest that it works really well with a cup of tea for breakfast! 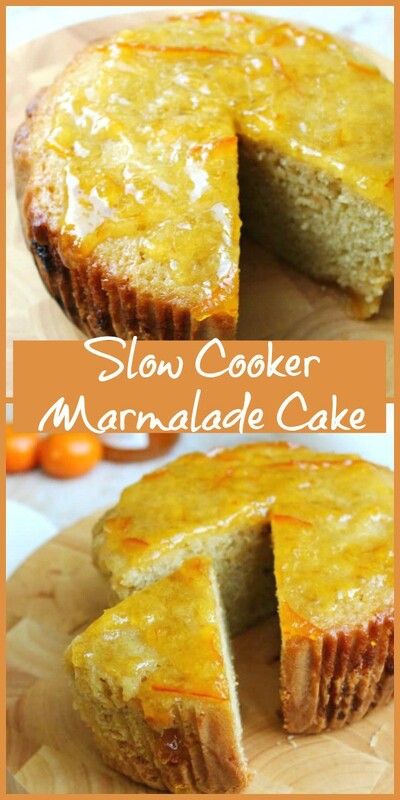 Slow cooker marmalade cake I hear you ask, but why baked in a slow cooker? Well if they taste great and bake while you work or play, why not? 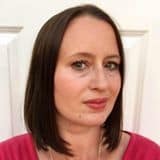 Slow cooker baking is a favourite pastime of mine, do have a look in my slow cooker archives for loads more ideas, and check out my guide to baking and desserts in a slow cooker. The cake takes about an hour and a half to bake, won’t burn quickly and if you have kids they can bake along with you. If you are a marmalade lover you have to try it! Much better than marmalade on toast. Why marmalade? I’m a big fan. If you aren’t from the UK you might not know our devotion to Seville orange marmalade, a preserve made from the juice and peel of Seville oranges. The peel of Seville oranges gives the marmalade a delicious bitter taste which contrasts so well with the sweetness of the orange. It is delicious on toast for breakfast and in baking! In my slow cooker marmalade cake the cake mixture itself is flavoured gently with marmalade and then I’ve poured some warmed marmalade on top to give it a thick glaze. I just love the colour it gives the cake. The cake is moistened by the marmalade and the method of cooking, it has a great crumb as you can see, and as it is a Madeira cake it is denser than a standard sponge. To bake in the slow cooker, the key to not getting a soggy cake is a clean tea towel/dishcloth under the lid, which catches any drips of condensation. Make sure you tuck up the sides so they don’t hang down over the side of the slow cooker though, to be safe. Perfect for afternoon tea as well as for breakfast, this is a simple but delicious cake. Go as easy or heavy on the marmalade glaze as you like! I think you can tell I am a big marmalade fan so my glaze is nice and thick. 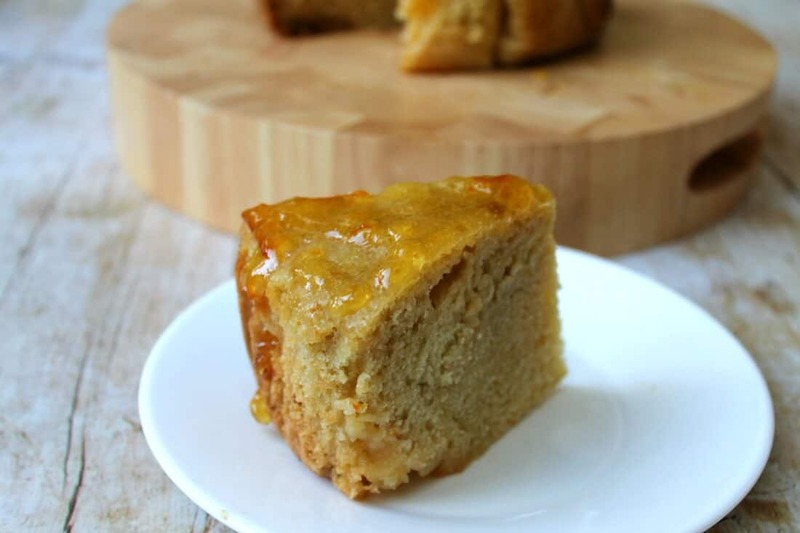 A slow cooker cake perfect for breakfast or snacking any time of day. Marmalade lovers will enjoy this! Cream the sugar and the butter together until fluffy. Add the vanilla bean paste or extract. Line your slow cooker pot. I use a round 3.5 litre slow cooker to make cakes, and line it with 2 large paper cake cases or loaf cake cases (available in pound shops etc). You could also use baking paper. Spoon half of the cake mixture into the lined pot. Add four to five heaped teaspoons of marmalade on top of the cake mixture and marble it in with a knife, then spoon the rest of the cake mixture on top. Add four to five more heaped teaspoons of marmalade on top. Use a knife to marble it through the cake mixture. Put the lid on the slow cooker with a tea towel tucked under it to catch drips. Make sure you fold up the sides of the tea towel over the lid of the slow cooker, so they don’t hang down over the edges of the crockpot. 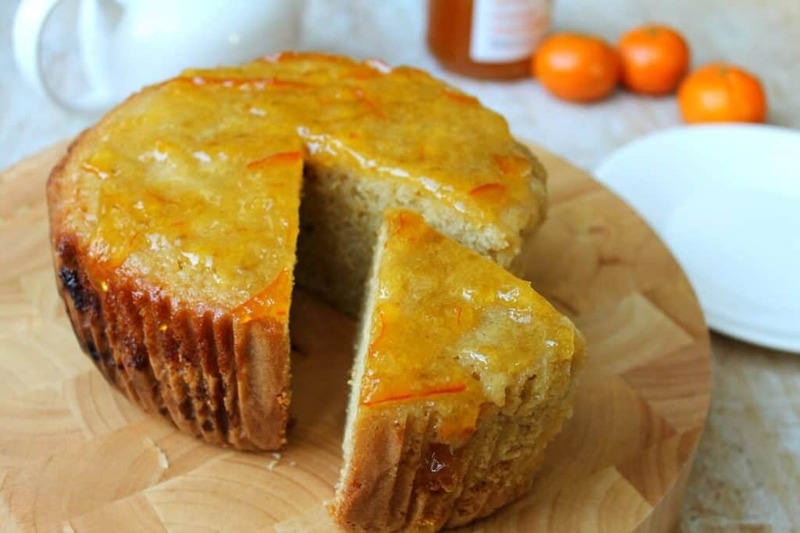 Make the glaze by warming 3-4 tablespoons of marmalade gently in the microwave in a small bowl. 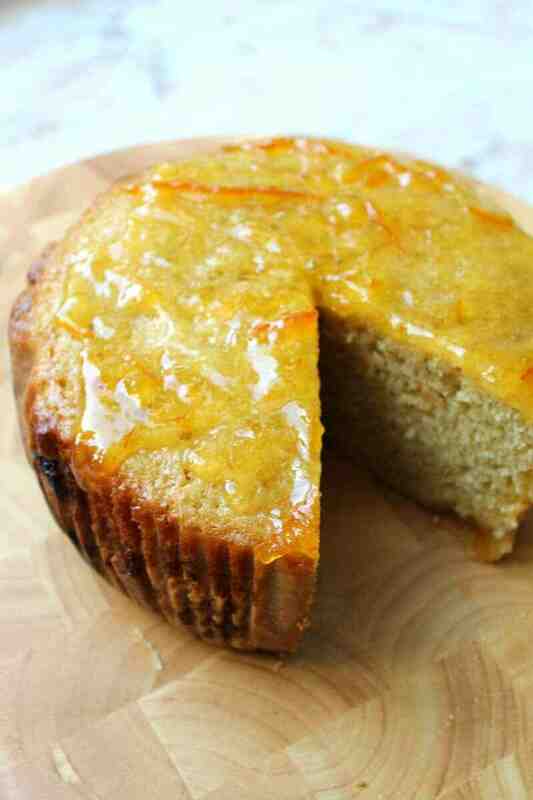 When the cake is cold, pour the marmalade over it and spread to the edges. This is a lovely wholesome cake. I can only imagine how perfumed it must be. I love marmalade! This sounds so delicious Lucy, and I know my Mum would just love it – she’s such a huge fan of marmalde! 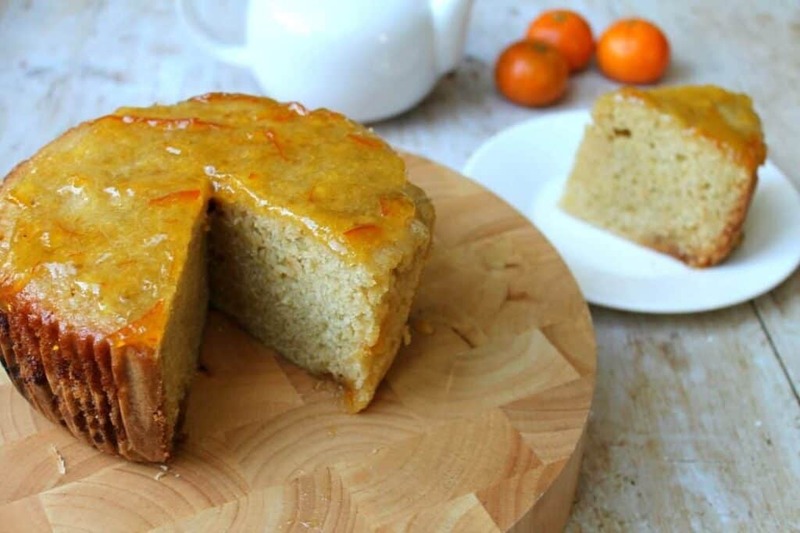 It’s really amazing how a slow cooker can produce such a fabulous cake. Thanks Angela – good to hear of more marmalade fans too! 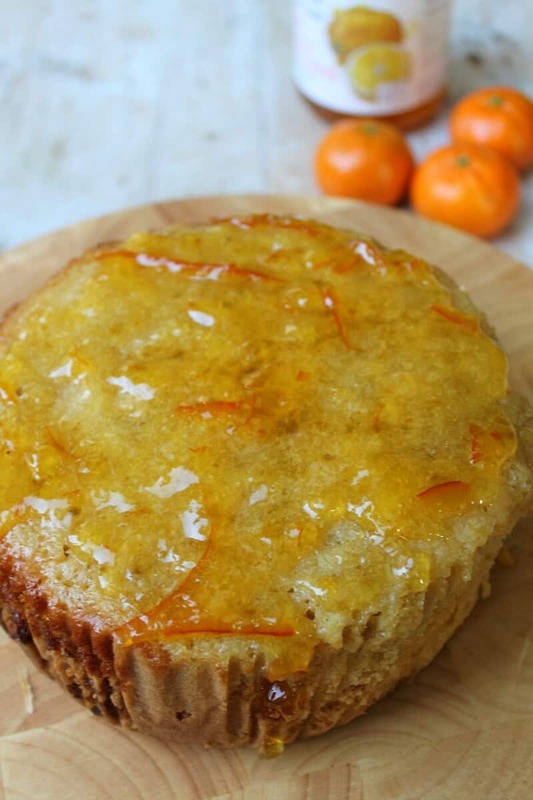 I adore marmalade cake, yours looks like it has a lovely texture and I love the thick layer of marmalade on top! I haven’t managed to make a successful crockpot bake, but this is a glorious looking recipe and I think I might have another go! I’ve only baked once in my slow cooker and it was a bit of a disaster. It was also the first time I’d used my slow cooker and for some reason decided a recipe for slow cooker cinnamon rolls was the best thing to try out. I was wrong! Thanks Cat! Cinnamon rolls sound good, I made berry ones in slow cooker ages ago, they were tasty but a bit of a mess! I haven’t yet made a cake in my slow cooker but as we’re both huge marmalade fans, think this might be the one I start with! Looks and sounds lovely. Brilliant, hope you do and that you enjoy it.